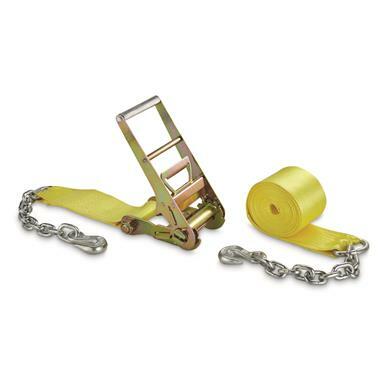 Secure IT Ratchet Strap, 27' x 4" with Chains and Clevis Hooks, Commercial Grade, 15,000 lb. A Ratchet Strap you can trust. Polypropylene strap measures 27'l. x 4" w.
Oversized handle measures 13" x 5.5"
This Secure-IT Strap is made to take on big jobs. It's commercial-grade tough, a 15,000-lb breaking strength that's sure to handle whatever project you throw at it. The Strap itself is made of polypropylene with 18" hardened-steel chains and 3/8" clevis hooks. It's also an ample 27' long and 4" wide. It's your answer for heavy-duty cargo hauling security. Strong polypropylene strap measures 27'l. x 4" w.
Strap Dimensions: 27'l. x 4" w.